The pace of life has become much faster. Yesterday's skin is past history. Your skin now needs to be strong! Now your skin needs to radiate a new self-confidence. 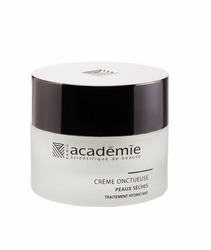 The Academie Rich Cream moisturizes the skin and keeps it hydrated. It strengthens your skin to fight against the external and internal fluctuations causing thousands of skin cells to die, resulting in dry and old-looking skin. Key component Original Apple Water provides instant hydration, while moisturizing ingredients regulate skin water balance, maintain optimum hydration rate into skin, boosts cell renewal and strengthens skin's self protection. Fight aging with this intense nutrition cream. Smooth, supple and radiant skin.